We've caught up this week with Los Angeles-based painter Preston M. Smith (PMS). 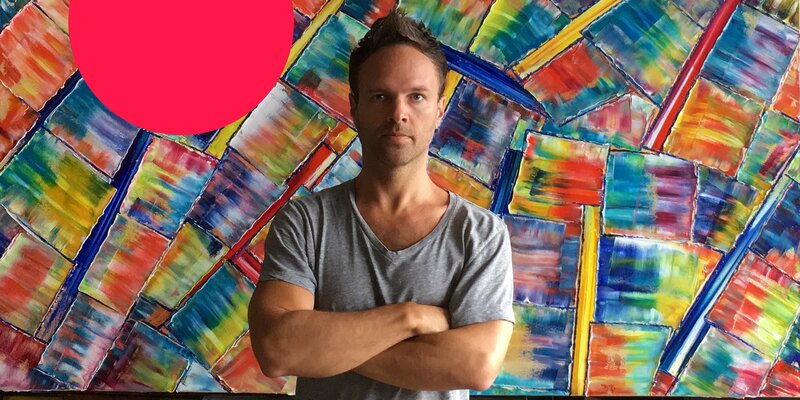 Preston embraces his love for color in his abstract and surrealist style oil paintings ranging from large canvases to his own 'micro paintings'. The incredible vibrancy of Preston's work has inspired a past commission of portraits of President Barack Obama for his 2009 Inaugural Purple Ball and his works continue to be featured in gallery exhibitions across Los Angeles. Unsurprisingly, his bold colors and moody figures have caught the attention of collectors across the world, including celebrities such as Ed Harris and Ashley Judd. Read on to learn more about how Preston explores his artistic talent. I have always had a strong urge to express myself visually. I grew up watching a lot of movies and the imagery from those films kind of seeped into my bloodstream. I would draw and doodle all the time and during long nine-hour road trips that I would take with my family. The imagery even at a young age came out as these surrealistic, sometimes morbid figurative studies, ha ha. My best friend and I as a child even created our own completed version of " Mad Magazine " with illustrated stories and written satire. We also made a lot of home movies that we acted in, edited and did the make-up for as well. I guess I just always wanted to be creating! You work primarily in the abstract and surrealist styles. What is it that inspires you? I found myself at an early age really enjoying telling stories with my drawings and this transitioned into my fine art as I matured and fed my surrealist pieces. However, I am in love with color and I found myself incorporating vibrantly colorful abstract backgrounds into these surrealist works. Then I began feeling the pull to become more and more abstract with each piece. I have always experimented with abstraction to an extent, but have been focusing on it more and more these days, though I still like to revisit my figurative work from time to time. It keeps me constantly inspired to be able to swing back and forth between these two genres. My mantra for creating my abstract work is simple: it is "color, texture, and beauty". These two genres also allow me to tap into intensely polarized emotions and be malleable with what I want to say, which is also important to me. What are the advantages of being an artist in LA? Well, I really found myself as an artist in Los Angeles. I'm originally am from small towns in Wyoming and Idaho and living in the city allowed me to discover a whole new side of myself and evolve, as I struggled to get my work seen and adapt to living in such a vast city. L.A. is interesting, because it can be so spread out and disconnected on one hand. On the other, it is filled to the brim with so many creative types of all kinds. Once you are able to tap into a community here, you can really take advantage of what the city has to offer. Like with theatre, there are so many galleries and exhibitions going on at any given time that it really rivals cities like New York. And each area is so different, between Chinatown, Downtown, Hollywood, West L.A., Culver City, Santa Monica and so forth, you get a lot of variety. There are also a lot of public work opportunities and of course you can't beat the weather! Your oil paintings vary from large canvas works to what you call "micro paintings". What is it that you like about working in such different scales? For me, it is all about growing as an artist and trying different things. Working on such different scales keeps me on my toes and never bored. It is nice with the micros, because you feel free to push yourself outside of your comfort zone and experiment with different styles and techniques. Sometimes, I will finish with a "micro" and think to myself, "wow, that could look great on a larger surface". Sometimes it translates and other times it doesn't, but it has taught me to work with a piece until the piece works. You can't be too stuck on one idea, you must adapt. Painting sometimes for me is just finding unique ways of solving problems. Working on different scales makes me better at that. In addition to being a successful artist, you're also a published writer. How does your art relate to your writing? Painting and writing to me are similar in so many ways. I have two novels (one co-written with a friend) and a compilation of original poetry and paintings. Novels are like figurative paintings, in that there must be a skeletal structure and are time consuming in their execution, whereas poetry and abstract painting to me are an exercise in automatism. I love to just sit down and force myself to write poetry without thinking. The better you get at it, the more the writing flows through you, not hindered by too much self-editing. This can be translated to abstract painting wonderfully. I like different aspects of each genre just as I do with painting. Writing has the ability to make you a better painter and vice versa. It expands your thinking and with both mediums you are challenging your audience ultimately to see a visual picture, one tangible and the other mental. You were commissioned to paint 12 portraits of President Obama for the 2009 Inaugural Purple Ball. What an amazing opportunity! Can you tell us what that experience was like? It was a truly awesome and whirlwind experience! I received a call from an artistic director of the Inaugural Purple Ball, who had heard about me from a mutual friend. He told me that they needed 12 portraits of President-to-be Barack Obama and that these paintings needed to be as close to duplicates as possible and that he needed them to be done and dry in three weeks time! They were to be distributed to celebrities such as Ed Harris and Ashley Judd at the ball. He asked me if I could do it and I immediately said yes, while secretly doubting it! I was working part-time at a restaurant at the time and spent the next three weeks with little sleep. I painted in the morning until it was time to go to work, went to work, came back and painted, slept for a few hours, rinsed and repeated. I had fans set-up drying paintings all over my apartment. It was a mess! I then had the chance to go to the Ball and Inauguration in Washington D.C. and meet and speak with these celebrities in person as they received my paintings. It was a phenomenal experience. I almost met the President and presented him with a painting as well, but he had to skip our event at the last minute due to an unforeseen issue that arose at the inauguration. Not too long ago you did a series of murals for the Motor Avenue Improvement Association. What was it like creating artwork outside of your studio? It was really fun and challenging. I was given three city locations that had these ugly, oversized electrical boxes protruding from the ground and was told to create whatever I wanted with them. It was really fun because I had creative control and envisioned each location differently. I painted a colorful geometrical piece on the largest one, and conceived the others a bit differently due to the way they looked and the context of their individual locations. I transformed one into a robot, and the other location into a mini city skyline with two colorful skyscrapers emerging from the ground. The robot stands guarding the newly constructed metro line in Palms, and the city skyline stands in front of a blue-clouded sky backdrop under the freeway bridge. It was really cool bringing color and life to this area. I actually had multiple people shout "thank you!" from their cars, or even stop on the street to speak with me as I was painting. You've exhibited at an impressive number of gallery shows. How would you describe these experiences in comparison to exhibiting on Artfinder? I feel in the past there was this misconception by most artists that once you got your work into the right gallery, everything else would fall into place. The gallery would take over and expose your work to the world and you would be fine. I am sure that is the case still for some artists, but more often than not, as an artist you have to have multiple irons in the fire, especially nowadays with the changing artistic and technological climate. This is what I love about Artfinder. It helps us as artists to take some control of our own careers and establish an online presence that can reach art-lovers from all over the world. If you put in the work and take it seriously, Artfinder can be a vehicle that can help you change your life. For me personally, it was a big part of the reason I was able to quit my day job and pursue my art full time. It has helped me to see my art as a business, in addition to being a creative outlet. I see myself as more of an artistic entrepreneur now and have become extremely proactive with my career. Online is the direction that the art world has been heading and Artfinder is such an amazing platform in that arena! Any exciting plans or exhibitions coming up? I am actually right in the middle of a wonderful four artist exhibition called "Deconstructing Color & Form". It is taking place at Beyond The Lines Gallery at Bergamot Station in Santa Monica, California, with artists Marc Yellin (another Artfinder artist), Betsy Enzensberger and Brigit Ritchie. I am showing a strong selection of my large abstract pieces along with a handful of micro paintings. It is a really colorful and fun show. I am also collaborating with another L.A. artist, Katie Bright on a couple of pieces for an upcoming exhibition at Gallery 825 in Los Angeles through the Los Angeles Art Association that I belong to. It should prove to be an interesting collaboration in that we both have such completely different styles and mediums and I am excited to see how they turn out! Kev Munday on being listed as one of the Telegraph's 'Five British Artists you need to invest in right now', being inspired by Basingstoke and creating animated characters! "In the last 2 months I've had orders on Artfinder from Hong Kong, Australia, USA and across Europe. Artfinder is definitely exposing my work to people who wouldn't have found me otherwise."